If you own a Keurig coffee maker, you have the benefit of brewing "coffee house quality" coffee and custom beverages at home. The Keurig coffee maker allows you to make coffee, tea and other beverages such as apple cider and hot chocolate, one cup at a time with Keurig K-Cups. This eliminates the occurrence of wasting excess quantities of coffee. While you might regularly consume the Keurig coffee for its taste and quality, you should also know its nutritional value. 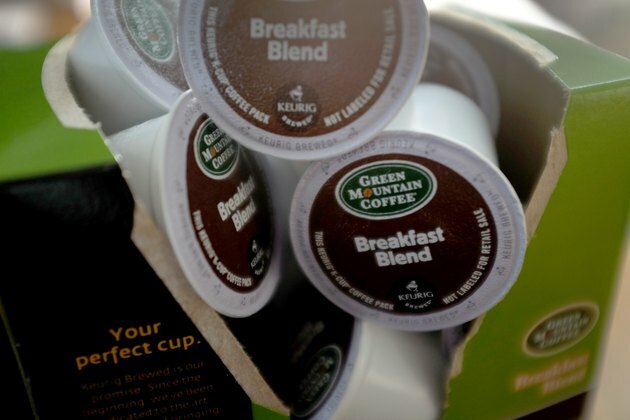 The Keurig K-Cups are manufactured by the Green Mountain Coffee Company. They offer several varieties and flavors to suit you and your family's individual tastes. In general, each variety has very similar nutritional values to the basic caffeinated Green Mountain coffee recipe. One Keurig K-Cup makes 6 fl. oz. of coffee and does not contain any calories. However, adding 1 tbsp. of whole milk adds 9 calories; adding 1 tbsp. of heavy cream adds 30 calories; and adding one packet of sugar adds 11 calories. Most sugar substitutes don't add any calories. Foods that contain some concentration of sugar usually contain carbohydrates. A plain cup of Keurig coffee does not contain any carbohydrates. Adding 1 tbsp. of whole milk or heavy cream adds less than 1 g of carbohydrates. However, adding one packet of sugar adds 3 g of carbohydrates. One Keurig K-Cup has 4 mg of sodium. This is not a significant amount given the recommended daily limit for consuming sodium. For example, if you follow a 2,000-calorie diet you can consume between 1,5000 and 2,300 mg of sodium each day, states the U.S. Department of Agriculture. In reviewing the nutritional value of the Keurig K-Cups, you will find that there is little or no concentrations of potentially harmful dietary elements such as fat or sugar. Additionally, coffee from Keurig K-Cups does not contain much nutritional benefit. However, you should monitor your coffee intake to know how much caffeine you are consuming. According to MayoClinic.com, one 6 oz. cup of coffee contains 95 to 200 mg of caffeine. Consuming more than 500 to 600 mg of caffeine each day is considered unhealthy.